There are a few key components to remember when sharing the Good News of God with others. First, it is important to state that God is the Creator of all things; thus, He is the ruler of all things since He made them. But man rebelled against the rule of God and sinned against Him. What will a good ruler do to those who rebel? He will most certainly not let their rebellion go unpunished, but will justly punish them. This is who man is: a rebel. Additionally, we have nothing good in us to cause us to return to Him. On the contrary, man is afraid of God because we all know that rebellion must be justly punished. And we don't want to be punished. Furthermore, it is in our nature (inherited from Adam) to be rebellious - not just to human authority, but to God's authority. Man knows he ought not rebel, but he possesses nothing in himself to stop his rebellion. This is what the Bible calls being "a slave to sin," the reward of which is death and punishment. As a result of man's rebellion, we fail to do what is right in our individual lives, our society, and our world. We have made a great mess of things, to say it another way. Enter the Good News of God: He sent His Son into the world to die in the place of rebels, to bear the punishment of rebels, though He was without guilt. Therefore, anyone who trusts in Him will not perish, but have eternal life, no longer eternal punishment as a rebel, for Christ has paid our debt! The question that logically follows, then, is this: why? Why would God send His Son to die for man, if man is so horrible, rotten, and rebellious? Ah! What a great question! The answer is simpler than you may think. It has nothing to do with man; it has everything to do with God. In a few short weeks, most likely you will gather around the Christmas tree with your family and receive gifts. Mom and dad will hand little Jimmy a neatly wrapped present. Little Jimmy, if he has any manners at all, will look his mom and dad in the eyes and say, "Thank you." Then, he will tear into the package with excitement and exhilaration! But let's assume that little Jimmy has the self-restraint to not tear into his present right away. Instead, as his mom and dad extend to him the present, he asks, "Why? I've done nothing to deserve this gift; why are you giving this to me?" How will his mom and dad respond? "Son, it's because mom and I love you. We want you to be happy. Accept this gift from us because we love you." And, if dad or mom wanted to make the point even more clear, they could add: "You've disobeyed us a lot, Jimmy. You don't listen right away and you have lied to us. You certainly don't deserve this gift. But it is because we love you that you are receiving this gift. You are receiving it because of us, not because of you." Humans possess a keen sense of entitlement and justice. "I get it because I deserve it" is generally the attitude we possess. Or we possess a great sense of justice and respond to gifts with an attitude of "If I didn't earn it, I don't want it." But just like little Jimmy, we are to receive the gift of God - Jesus Christ - by faith and trust in His love for us. Lauren was feeling badly the other day because we are going to give our family some homemade gifts for Christmas (surprise!). She was embarrassed because she didn't want to be viewed as cheap or stingy. (The truth is, Lauren worked for hours on these Christmas gifts. In my opinion, these gifts of sacrifice are worth far more than something bought from a store.) "This is the thing about gifts:" I reminded her, "it's something given to others on no account of them. However they respond, we are giving what we have to others because we want to, not because they asked for it or because they earned it." Man certainly hasn't asked for a Savior, and we certainly haven't earned Him. This Christmas, as you tear into your gifts, pause to think about this: "For God so loved the world that He gave His only Son, that whoever believes in Him will not perish, but have eternal life" (John 3:16). 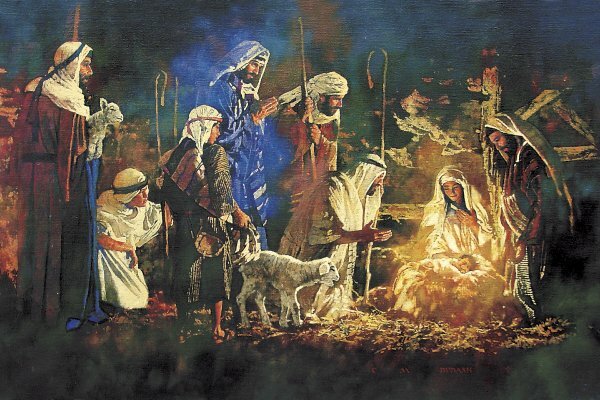 Some people claim that we give gifts to others at Christmas because the wise men gave gifts to Jesus. The Bible tells us, however, that we give gifts to others at Christmas because God gave man a gift because "God is love" (1 John 4:8). Christ has come because of God, not because of man. For that, we ought to be forever thankful. "In this is love, not that we have loved God but that He loved us and sent His Son to be the propitiation for our sins" (1 John 4:10).